A barn / garage with a land attached of 520 sq m.
there are situated just in front of the barn. Nota Bene: the barn is approx: 96 sq m.
The roof is high enough to have the possibility to create another floor. 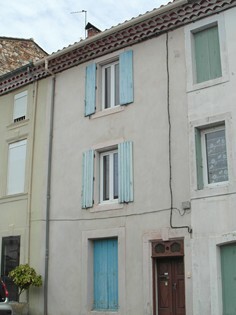 For sale in Saint chinian at 3 bedroom town house a garage. and 1 hour and 10 minutes from Montpellier. Ground floor : entrance, a garage. First floor : kitchen and a living room corner. 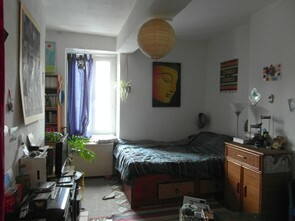 Second floor : 2 bedrooms including 1 without window, a shower room, a toilet. Third floor : an attic and a bedroom without window. 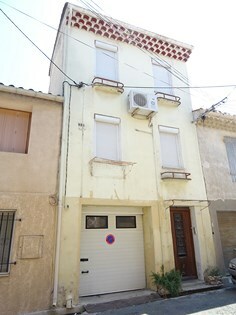 2 reversible air conditioning units, quiet location, garage 20 sq m.
Living space about 54 sq m.
For sale in Saint Chinian a Spacious town house close to the shops. away from Beziers and 40 minutes away from Narbonne. 1 bedroom, a shower room with a toilet, a courtyard of 8 sq m.
living room, an american kitchen, a shower room with a toilet. need works. Living spaces: ground floor: 40 sq m. First floor: 23 sq m.
Second floor: 34 sq m. Total living space is 97 sq m.
NB : diagnostic made only for the first floor, according the bills given. 5 minutes from Saint Chinian, nice town which provide all facilities. and 1 hour and 23 minutes from Montpellier. with open view on the south. This land is not « in subdivision », with more liberty for the construction. The land is planted, olive trees… It is also south-east facing. There is actually a planing permission on it which can be changed …of course.